One way to grasp the nature of politics is to understand the key terms in which it is discussed. Unexceptional Politics develops a political vocabulary drawn from a wide range of media (political fiction, art, film, and TV), highlighting the scams, imbroglios, information trafficking, brinkmanship, and parliamentary procedures that obstruct and block progressive politics. The book reviews and renews modes of thinking about micropolitics that counter notions of the “state of exception” embedded in theories of the “political” from Thomas Hobbes to Carl Schmitt. 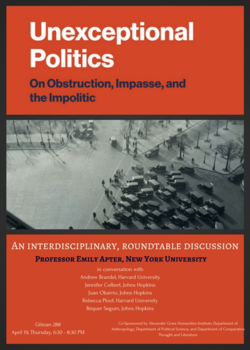 Emily Apter develops a critical model of politics behind the scenes, a politics that operates outside the norms of classical political theory. She focuses on micropolitics, defined as small events, happening in series, that often pass unnoticed yet disturb and interfere with the institutional structures of capitalist parliamentary systems, even as they secure their reproduction and longevity. Apter’s experimental glossary is arranged under headings that look at the apparently incidental, immaterial, and increasingly virtual practices of politicking: “obstruction,” “obstinacy,” “psychopolitics,” “managed life,” “serial politics.” Such terms frame an argument for taking stock of the realization that we really do not know what politics is, where it begins and ends, or how its micro-events should be described. 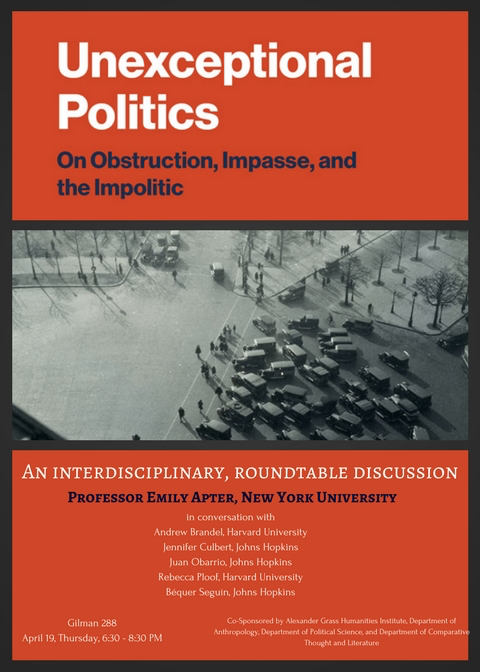 Emily Apter will be joined by Jennifer Culbert, Juan Obarrio, and Bequer Seguin from Johns Hopkins University and Andrew Brandel and Rebecca Ploof from Harvard University.